the winters most captivating plants. 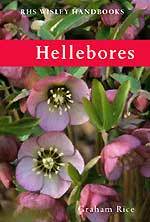 Here youll find information and pictures on wild species hellebores and Orientalis Hybrids, or Lenten roses as theyre sometimes known, on Christmas roses, on botanical classification, on hellebore propagation and cultivation, on hellebore books as well as my articles from The Garden and from other magazines. Youll also find a directory of sources for hellebore seed and plants. The text on this site is based on the book written by myself and Elizabeth Strangman. I have expanded this to add additional information and also to incorporate more recent discoveries and introductions. Enthusiasm for hellebores is still on the increase and here youll find all you need to know about hellebores, with information on keeping your hellebores happy and propagating them successfully. Words ©Graham Rice or © Graham Rice/Elizabeth Strangman 1993-2001. Pictures ©Graham Rice/gardenphotos.com unless stated. All Rights Reserved.